My daughter called from university today to ask for an Advent calendar. These are the rather large, but quite thin boxes that hide chocolates under numbers, which count the days before Christmas. It's also a very clever way to sell chocolates and to count the days before the day when lots of people get to open the socks or whatever, that we knitters have managed to knit for them. Actually Advent has its roots in both christian and non-christian practices, as a time of austerity before a big event, Christmas and the feast of Saturnalia perhaps. However, if it is a time of restraint, please explain the chocolate! Anyway I guess that Halifax doesn't do Advent Calendars (hmmm what does this say about Halifax?) or maybe my children think of advent calendars as something that is sent from far away - their aunt, who lives in Edinburgh and keeps the faith, always sent the kids Advent Calendars. Well, regardless of your spiritual leanings, small things, like the single bite sized piece of chocolate eaten each day from Dec 1 to Dec 24, can be one of those little activities that enrich a day! I like to think that she wanted the calendar because she wanted a way to count the time before she was able to come home for Christmas break - dream on - it's really all about chocolate. The calendar, though, actually gave me an idea for retailers. If something as small as a piece of chocolate can make a day, what can you give your customers that is a tiny bite sized offering but makes their day? Perhaps, it's a daily quiz and people keep track of their wins, which are then "cashed in" for "something" in the short week between Christmas and New Year. Maybe, it's a sale item that is not advertised and only on for one day, or a daily draw with most numbers at 5 or 10%, but have 1 biggie at 30 or 40%. You have to hunt a bit for the correct number on the advent calendar so the suggestion is that it's a game or a challenge. I'll leave the rest up to you. Advent doesn't actually start until Nov 28 and if you really wanted to be commercial about it, you could start Dec 1. Dinner - of course something with chocolate. Mexican dishes often use unsweetened chocolate in their savoury main courses. Here's one for chicken - it's in the middle of the page. I also couldn't leave you without a picture. This is "Chocolate Covered Cherries" from Heartstrings. 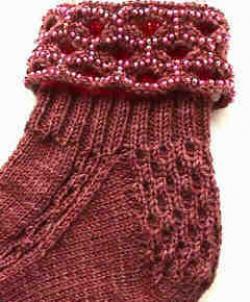 The pattern also includes instructions for fingerless gloves - to eat chocolates with, of course!